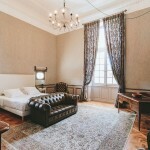 The prices of guest rooms provided are based on one night for two people, fresh breakfast and aperitif included; a wine tasting in the cellar is also offered. All the prices are counted in Euro (EUR) and include VAT at the prevailing rate of 10%. 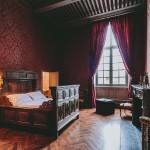 With its luxurious tapestries, French style ceilings, shimmering silk curtains , and stone fireplaces, the atmosphere of the King’s Suite immerse you in the Ages of Louis 14 with a view of Courtyard of the Castle. Period Beds 190*150 cm and 200*140 cm. Spacious and elegant, the Suite of Riquet once accommodated the famous architect Paul Riquet during his construction of the Royal Canal. It features a magnificent view of Terraces of the Castle and the Plain of Aude till the Pyrenees mountains. With its golden reflections, The Countess suite introduces you a moment full of relaxation and pleasure with a view of the Courtyard of the Castle and the swimming pool in the shelter of Cloister. Spaciousness and refinement are the major expressions to describe the Baron Jougla’s suite, with a view of the Terraces of Riquet and the the swimming pool in the shelter of cloister, a privileged access to the pool. 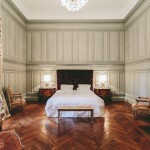 15% off discount on your stay counting from the 2nd night. Please find below some information about the services you can expect during your stay at Chateau de Paraza. Do not hesitate to contact us if you need more information or some special services. The Wine Bar in the cellar is open from 10am to 8pm to offer you many refreshments. A mini-bar space is also available in the Château, which includes a fridge, a kettle with a selection of teas and infusions, and a Nespresso machine. All stays are free for children under two years-old. A baby cot can be made available free of charge upon request and depending on availability. Our pet friends are not allowed inside the Chateau and the commons. 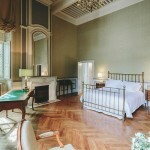 Access to the swimming pool is reserved to guests staying at Chateau de Paraza, from 8am to 8.30pm. The swimming-pool is not supervised. Children below 16 years-old must be accompanied by an adult. You would like to spend your holidays or celebrate a special event in a unique environment with an intimate setting? We offer you to book the exclusive use of the Château: the 4 main Suites, the Great Living Room, the Music Lounge, the Dining Room, the Kitchen, the Swimming-Pool and the Gardens. 2-5 double bedrooms can also be made available on the 1st floor. Enjoy tailor-made service and freedom of mind for your holidays. Kindly contact us for any information.